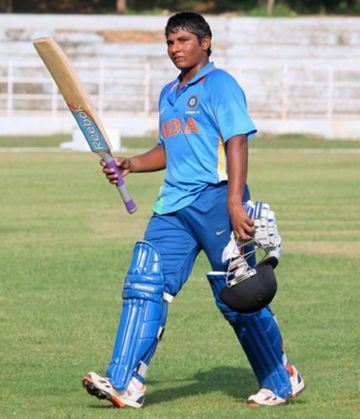 India put up a spirited bowling performance before Mumbai youngster Sarfaraz Khan struck an unbeaten half-century to steer the team to a seven-wicket win over Bangladesh and clinch the Under-19 Tri-series ODI tournament title in Kolkata. After bundling out Bangladesh for 116 in 36.5 overs, India reached 117 in just 13.3 overs, losing three wickets in the process. Opting to bat, Bangladesh kept losing wickets at regular interval as the home team bowlers wreaked havoc with left-arm spinner Mayank Dagar scalping three for 32, while Shubham Mavi (2/21) and Mahipal Lomror (2/11) claiming two wickets each at the Jadavpur University second campus ground in Salt Lake stadium. Chasing a modest target, India suddenly found themselves struggling at 42 for three in 6.3 overs from 38 for no loss. But Sarfaraz, who plays for Uttar Pradesh in the Ranji Trophy, steadied the boat. He hit a blistering 27-ball 59 not out (9x4, 3x6) and in the able company of skipper Ricky Bhui (20 not out from 20 balls; 4x4) put up an unbroken 75-run match-winning partnership to chase down the target in the 14th over. The burly Mumbai right-hander, who had a quiet tournament before the match, returned to form with a superb knock. He was particularly brutal against Bangladeshi left-arm spinner Saleh Ahmed Shawon Gazi as he raced to the fastest half-century of the tournament. Gazi conceded 15 runs and 20 runs from his ninth and 11th overs, respectively with Sarfaraz striking 4, 6 and 4 before following it up with 4-6-4-4 in the next over to reach to his fifty in 23 balls. Sarfaraz had a close call on 11 when his flashy drive over covers was missed by an outstretched Pinak Ghosh, who failed to get on to the difficult chance. Earlier, Sarfaraz had knocks of 2, 0 and 12 in his first three matches but he came up with a brilliant performance when it mattered the most and was adjudged the man-of-the-match for his efforts. Delhi left-hander Rishabh Pant, who topped the run charts (282) with a ton and two half-centuries from four matches, was adjudged the man of the series. Congress opposes GST bill, Sonia meets Modi: What exactly are the sticking points? READ NEXT >> Congress opposes GST bill, Sonia meets Modi: What exactly are the sticking points?